As always, we want our ‘treats & sweets’ to be healthy, right? This from Elizabeth, an amazing yogi, gardener and otherwise good-for-the-planet soul. 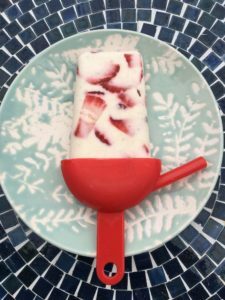 Combine all ingredients in a bowl and mix well, spoon into popsicle molds and tap them on the counter to remove any air bubbles. Freeze for 3 to 5 hours to set. Enjoy!